Give your skin a healthy glow by brushing it gently with a soft brush, loofah or dry face washer. This stimulates the lymphatic system and gets rid of dead skin cells. It also increases circulation and improves the overall look of your skin. A true day spa beauty treatment! Apply foundation with a damp sea sponge. Dab it on, do not drag it across or down. If you have trouble finding a shade of foundation to suit your skin type try buying a light shade and a dark shade. You can then mix together just the right tone. Enlarge eyes by using a pale shade of eye shadow just below your eyebrow. Use a small amount of white or pale eyeliner on the inner rim of your lower lashes. This really helps bring out the whites of your eyes. Whiten your teeth – believe it or not white teeth also highlight the whites of your eyes. Fake it – For special occasions enhance beautiful eyes with false eyelashes, you will be amazed at the results. This does take some practice but is well worth the effort. My preference is for individual lashes. In addition to the instructions on the box I would add that a great way to position them is with a toothpick and to curl your real lashes before applying the false ones. Apply foundation over your lips and then line with lip liner. Fill in the whole lip area with lip liner. Apply lipstick over the top. For a fuller pout apply lip gloss to the centre of your bottom lip. Hair shines when the cuticles of the hair are smoothed down. Try combing through your conditioner while you are in the shower and rinse with cold water. Apply a leave in conditioner after you have towel dried your hair. Always blow dry your hair pointing the nozzle downwards so that the cuticles stay smooth. Honey with its healing and antiseptic qualities dabbed onto a blemish and left overnight will kill the infections that cause pimples. Witch hazel or baking soda are natural deodorants, that work just as well as commercial deodorants and don’t contain harmful chemicals. Yoghurt and lemon juice mixed together for softening hands. Yoghurt applied to the face every morning will keep the complexion smooth, healthy and fresh. Wash it off after a few minutes with cold water. Avocado on its own makes a wonderful mask. Mash it up and smooth it on. Leave for 15 minutes and gently rinse off with warm water. Banana mash and apply. Leave on for no more than 5 or 10 minutes, then rinse off completely. Pineapple can be peeled leaving 1 cm of fruit on the peel. Smooth it on, flesh side down and rinse off. Aloe makes a great shaving gel. Buy a plant, break open a leaf and voila! Also great for healing cuts. Shea or Cocoa Butter beautiful as a lip gloss. If it is too thick rub it between your fingers to soften it. Homemade spa recipes and homemade skincare are worth the little extra effort. Organic ingredients provide the best result. Be creative and surprise yourself. Careful though, with the simplicity of these homemade spa recipes it is possible to overindulge… how wonderful! We all need a time out from our busy schedules to indulge, pamper and rejuvenate our body and soul and a Home Spa is a great way to do it. 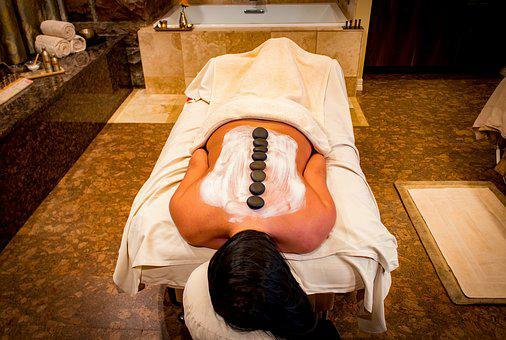 The Spa experience is one to be savoured. The following suggestions will help you create a day just for you. Sound… plug in your stereo and put in your favourite relaxation music or if you are a mother you may just want to savour the silence!!! Enjoy and above all do it regularly… you deserve it!